The specialization of our organization lies in making available the advanced Automatic Nut Tapping Machine (Double Spindle Type). 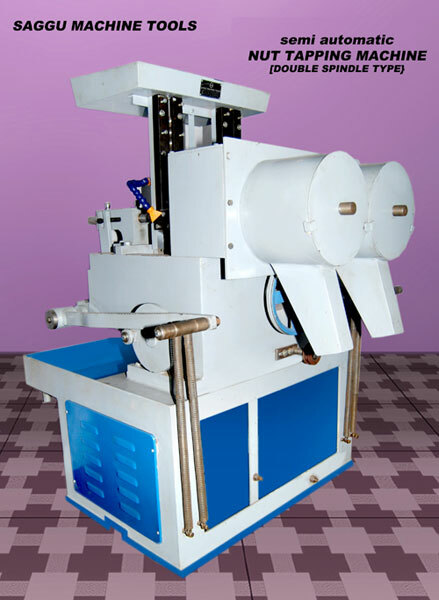 The SMT Automatic Nut Tapping Machines are manufactured from high grade materials. These Automatic Nut Tapping Machines are widely appreciated by our clients for high performance and are available at very reasonable prices. Automatic Nut Tapping Machines are most economical for Tapping on Hex, Square Nuts of good quality. These machines are designed in such a way that breaking of taps is eliminated. Moreover having long service life, our Automatic Nut Tapping Machines are high in demand. Consequently, we have become a prominent name as Automatic Nut Tapping Machine Manufacturer, Exporter and Supplier in Punjab (India). Note : *All specifications are subject to change without any prior notice.